Unfortunately our time at the incredible apartment in Mossel Bay had to end. Armed with our usual arsenal of tuna and laughing cow cheese sandwiches we headed off on our last leg in the trusty and tiny Chevy Spark. The 400 or so kilometers rolled by fairly uneventfully and we were at our hostel, the Green Elephant, by noon. We thought we'd lucked out and found a cheap double, treating ourselves for the last leg of non-camping for a while. All seemed fantastic as we checked in, finally crammed all our stuff into our packs after two weeks of spreading across the car, and returned Sparky to the CBD. That afternoon we wandered about the Bo-Kaap district, settled into a bar called The Slug and Lettuce for $2 pints before enjoying an Indian dinner. We then headed to Long Street for some pub trivia, getting beaten by The Virginitals by a point, but enjoying it. Reveled in the question asking how many players in an Australian Rules team. Tom also reveled in the complimentary onion rings. Returning to our hostel we were told there was a mixup and we'd have to pay more for our room. Much more. We baulked at the 300% price increase and sent out some couchsurfing s.o.s messages. The next morning our pleas were answered by Em, a 24 year old masters student living near the center of town. We got in contact with her and were told it would be fine for us to stay and we could head over that afternoon. Overjoyed with this knowledge we trooped off to climb Table Mountain. This perhaps wasn't the wisest move in the mid-day 30something degree heat. A few bottles of water, a near fist-fight between us, several threats of pushing one another off steep cliffs and an hour and half of steep climbing saw us enjoy a sensational view over lunch at the top. We rested awhile before catching the cable-car down, a construction Mads' great-grandfather had helped initially build. That afternoon Em met us at the minibus station and we made full use of the kitchen, cooking up a feast. The next day we were picked up at Em's and driven out to Stellenbosch. Throughout the day we got a brief history of the area, visited Tokara, Solms, Villera and Fairview wineries, ate a great lunch, along with 'sampling' a fair bit of wine and cheese. We returned home stuffed, but still bought a loaf of artisan bread, half a wheel of Brie and a bottle of sparkling Shiraz. Couldn't go without supper. Woken up by wind the next morning we thought we could be up for an inside day, but decided to try and see a few things in the hope of better weather. We caught the student shuttle out to the University of Cape Town and wandered up to the Rhodes Memorial, which overlooks the city. Following this, Mads indulged Tom's love of going long distances slowly and we walked to Kirstenbosch Botanical Gardens. We spent the afternoon napping on the grass, reading in the sun and following the walking path set up for those who are sightless. We tried to do it with our eyes shut, a pretty scary experience. That evening we went to an annual outdoor theatre that does modern interpretations of Shakespeare. This years choice was A Comedy of Errors, set to a kung fu theme. Mis-timed sound effects, a panda and noodle-boxes were used to great effect. Though it sounds like it might stink, the show was really good and we had a great night. The next day Mads walked to the District 6 museum to recount the history of the area we were staying, while Tom went for a trot. Both of us got caught in the rain and spent the afternoon inside. Saturday saw us meet up with some other people from couchsurfing and head to Guguletu, or Gugs as its commonly known. This Eastern suburbs township is home to Mzoli's, a restaurant unlike anything either of us had been to. After buying some beers from a house across the road, straight from their fridge, we took this into the restaurant, which is really a large space with a tin roof, lots of plastic chairs and DJ playing deep house. Our group of twenty or so all pitched in some money and we headed to the part of the restaurant where you order. This looks like, and is, a butcher's counter, with different cuts of pork, beef, chicken, lamb and a few varieties of sausage. We ordered a mix, chose to have the additional sauce added and watched it all tossed in braai spice. Then we took our bucket of meat, paid for it and took it to the braai room. This second room had two huge coal grills, and all the meat was thrown on, with the instructions to come back in half an hour to collect. We did so, picked up some pap and chakalaka (maize meal and a type of relish) and got greasy. After eating, we sat about, drank another beer before Tom decided his appetite wasn't sated. Returning for more lamb chops, pork loin and a t-bone, bloodlust was eventually fulfilled. We joined the rest of our group across the road to where we bought the beers, watching some local kids dance on their self-constructed stage. We got our lift home and insisted on a vegetarian dinner. That night we headed out for a few drinks at a little bar called Alexander's, called so due to each table having an antique telephone with which you could call the bar for service, or another table just for a chat. We were up early on the Sunday to pack our bags, cursing down the stairs and getting lost on the way to meet our bus. We boarded the Bailey's Reo Liner, left on South African time (half an hour late), headed in the wrong direction for a while before finally hitting the highway for the 21 hour, 1600km drive to Windhoek, the capital of Namibia. 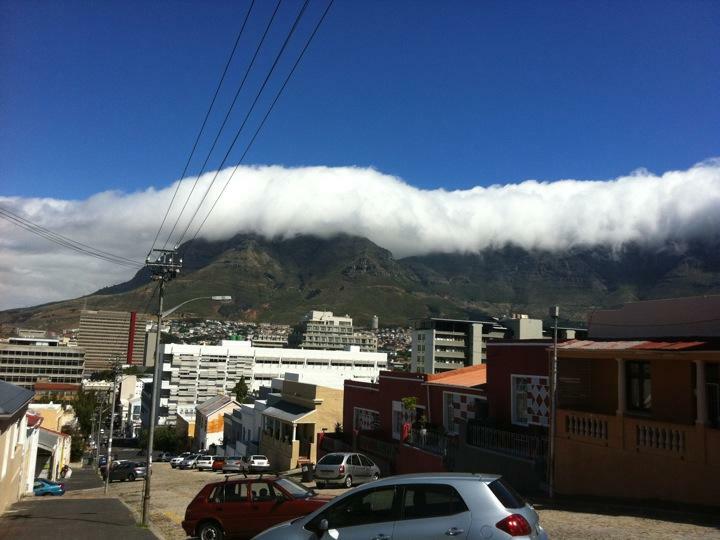 We enjoyed our time in Cape town immensely, but found it very different to the rest of South Africa. It has a very European feel, and at times you forget where you are, but there are still the same problems of separate worlds between the blacks, whites and coloureds that exist throughout most of South Africa. It is a city that we both agreed we could live in for a period of time.